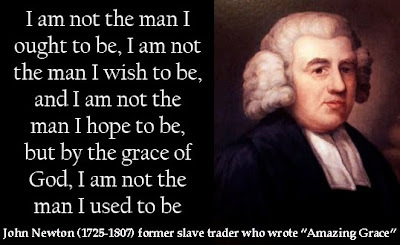 John Newton was born in London in 1725, and went to sea with his father when he was only eleven years old. As a teenager he was forced to serve on a warship, and because he hated it, he deserted. He was captured, flogged, demoted, and generally mistreated. Eventually he asked to be exchanged to a slave trading ship working the waters off of Sierra Leone, Africa. He was abused on that ship, too, but his luck changed when he was rescued by a captain of another ship who had known his father. During this time Newton saw how much money could be made trafficking in slaves, and eventually he became captain of his own slave ship. He prospered; but with little or no religious belief, he had no conscience about the business he was conducting. Then, on a voyage back to England everything changed. He was desperately trying to steer his ship through a violent storm, but became convinced that all was lost. At the very moment he thought the ship would sink, he surprised himself by calling out, “Lord, have mercy on us.” Instantly the storm began to abate. Perhaps it was just a coincidence. But he thought about it a lot. Eventually he became convinced that God had spoken to him through the storm. His life changed, and he got out of the slave business. He married, and then, believing that he was called by God to proclaim the Gospel, he immersed himself in the study of Scripture and theology. Eventually he was ordained to the priesthood in the Church of England. What do you think about the conversion of a slave trader? What about the hundreds, maybe even thousands, who had died on Newton’s ships? What about the thousands more who wished they had died? All this misery so that he could become a rich man! He had ignored God for years and then turned to him in a crisis. He opened his mind and then his heart to GRACE - the undeserved gift of God’s love, forgiveness and new life. Is God unjust to have accepted John Newton? . . . and then, to have called him not just to fellowship, but to leadership in the Church? It is quite human to be scandalised by the generosity of God to horrendous sinners. Graham Greene said: “You can’t conceive, nor can I, the appalling strangeness of the mercy of God.” Well, we are shocked, but we shouldn’t be, because we, too, have received his “grace heaped upon grace” (John 1:16). Who are we to begrudge anyone their opportunity to respond to God’s love? Yet, one of the themes in the Gospels is how deeply Jesus shocked the judgmental guardians of the religious establishment with his teaching on the Father's unconditional love and profligate forgiveness and grace. “Jesus' story makes no economic sense, and that was his intent. He was giving us a parable about grace, which cannot be calculated like a day's wages. The employer in Jesus' story did not cheat the full-day workers. No, the full-day workers got what they were promised. Their discontent arouse from the scandalous mathematics of grace. They would not accept that their employer had the right to do what he wanted with his money when it meant paying scoundrels twelve times what they deserved. Significantly, many Christians who study this parable identify with the employees who put in a full day's work, rather than the add-ons at the end of the day. We like to think of ourselves as responsible workers, and the employer's strange behaviour baffles us as it did the original hearers. We risk missing the story's point: that God dispenses gifts, not wages. None of us gets paid according to merit, for none of us comes close to satisfying God's requirements for a perfect life. If paid on the basis of fairness, we would all end up in hell." God’s grace comes to different people at different times and in different ways. And that includes you, dear reader. Maybe you have not been the person you could and should have been. (Who has been?) But you haven’t missed out on God. He loves you. His grace is so amazing that it reaches you as you read these words, even if this is the eleventh hour of your life. There is still time for God to break through to your life if you let him. God hasn’t given up on you. That’s the good news. Whether you’ve been a lukewarm Christian or someone militantly at war with God . . . it doesn’t matter. Nothing you have done has stopped him loving you. He wants to forgive you, set you free from your past, and transform you into a channel of his love and grace for others. But he doesn’t want you to waste any more time. He loves you. He wants you. And if you say “yes” to him you will discover how amazing his grace really is. John Newton was ordained in 1764 and accepted the curacy of Olney, where he lived until 1780 when he became Rector of St Mary’s Woolnoth, in London. There he drew large congregations and influenced many, among them William Wilberforce, who would one day become a leader in the campaign for the abolition of slavery. Newton continued to preach until the last year of life, although he was blind by that time. Originally buried at Woolnoth, Newton’s remains and those of his wife Mary were re-interred at St Peter & Paul's Church, Olney in 1893. Once an infidel and libertine. and 28 years as Rector of St Mary Woolnoth.